Black Ash (Fraxinus nigra. Marsh. )-Slender, upright tree with narrow head, 50 to 90 feet high; twigs stout. Bark close textured, dark grey, with interlacing furrows; twigs smooth, grey, with pale lenticels. Wood brown, soft, heavy, tough, splitting into annual layers along the porous spring wood. Buds broadly ovate, almost black, granular-pubescent; inner scales becoming leaf-like. Leaves in May, 12 to 16 inches long, of 7 to 11 oblonglanceolate leaflets, all but terminal one sessile; margins with incurving teeth, upper surfaces dark green, smooth; lower pale with rufous hairs in tufts along pale midribs; fall early, after turning rusty brown. Flowers, May, before leaves, dioecious, in axillary panicles; stamens dark purple with short filaments; pistils with long cleft purple stigmas, often with abortive stamens below. Fruit winged keys in open panicles, 8 to to inches long; seed flat, short, surrounded by wing which is broad, thin and conspicuously notched. Preferred habitat, deep, cold swamps and stream borders. Distribution, Newfoundland and north shore of Gulf of St. Lawrence to Manitoba; south to Delaware and the mountains of Virginia, southern Illinois, central Missouri, and northwestern Arkansas. Uses: Wood especially suited for baskets, chair bottoms and barrel hoops; also used for fencing and fuel, for cabinet work and furniture. Saplings used for hop and bean poles. If you have learned to recognise an ash tree at sight, it is an easy matter to distinguish the black ash at any time of year. It is the slenderest of them all, rarely more than a foot in diameter, even though its height be over So feet. The trunk looks like a dark grey granite column, so even and close textured is its bark. In winter the blue-black buds are our best identification sign. 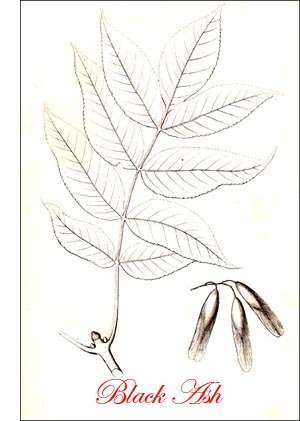 They are only "exceeded in blackness" by the buds of the European ash (F. excelsior). Tennyson, describing the eyes of the gardener's daughter, uses this striking simile: " Black as ash buds in the front of March." The foliage is so dark green it looks black at a distance and the side leaflets have no stalks. Like its European cousin, the black ash is unusually late in coming out in the spring. Often it is the middle of May before the black outer pair of bud scales fall, and the two inner pairs broaden and lengthen and turn green to help for a short season the opening leaves. As a rule the staminate flowers are on different trees from those bearing the pistillate, and rarely a few perfect ones. The black ash is not a tree for the lawn. It loves to stand with its roots submerged, and often dies of thirst in the rich loam of a garden. It is a short-lived tree, at best, and very slow of growth; it keeps its foliage but a short time, turning a dull, rusty hue in early autumn. So we shall not wish to plant it anywhere unless perhaps in swampy land. The roots range far and wide and drink up the moisture at a marvellous rate. A few trees will soon cover such a tract, sending their seeds broadcast, and throwing up suckers from their roots. It was the Indians who taught our forefathers to weave baskets of black-ash splints. The wood is split into sticks au inch or so wide and two or three inches thick. These are bent over a block, and the strain breaks the loose tissue that forms the spring wood, and separates the bands of dense, tough summer wood into thin strips suitable for basket weaving. The grain of black ash is normally straight, but warty excrescences called "burls" form on the trunk sometimes, and these show wonderful contortions of the grain. Innumerable radiating pins, or abortive branches, keep on growing within the wood, each the centre of a set of circles or wavy lines, which show when a "burl" is cut across. Bowls hollowed out of single burls and polished show exquisitely waved lines as delicate as those in a banded agate. European ash sometimes shows a twisted and warped con, dition of the fibres known to woodworkers as "ram's-horn" and "fiddle-back" ash. Knotty parts of stems and roots once went under the trade name of "green ebony," and fancy boxes and other articles made of it and polished brought extravagant prices. "When our woodmen light upon it, they make what money they will of it," says Evelyn. And he tells of a famous table made of an old ash tree on whose polished surface "divers strange figures of fish, men and beasts" were discernible in the grain of the wood! Another enthusiast, with still livelier imagination, saw in the cleft trunk of an ash tree, before it was polished even, "the various vestments of a priest, with the rosary and other symbols of his office!"